Five days after Yom Kippur Jews begin the celebration of Sukkot. This festival is one of the three biggies (the other two are Passover and Shavuot). I know what some of you are thinking and the answer is no, Chanukah is a very minor holiday. The three “biggie” festivals as well as Rosh Hashanah and Yom Kippur are the only holidays ordained by God in the Torah. All the other holidays such as Chanukah, Purim, and my birthday were either created by Rabbis, other great leaders or as in the case of my birthday by a blogger looking for attention (note one man-made holiday does reach the level of the “biggies” above–that is my wedding anniversary -that is because of a Hebrew phrase called “Shalom HaBayit” peace in the household). Speak to the children of Israel, saying: On the fifteenth day of this seventh month, is the Festival of Succoth, a seven day period to the Lord. The first of Nisan (which is the first month). Passover is 15 days later. It is said seventy individuals went into Egypt to become slaves and we came out as one people. Nisan celebrates becoming one people and meriting our redemption from Egypt.The first of Nisan is also a reminder to start adding fiber to our diet because all that matzoh we are about eat two weeks during Passover is going to be like cement in our intestines. The last new year, the first of Elul, is the New Year for the tithing of cattle. The tithe for cattle had to be made from cattle born in the same fiscal year, between the first of Elul one year and the next. 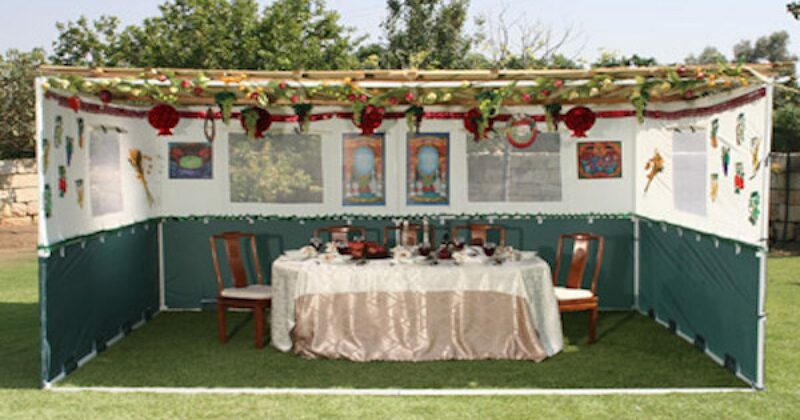 Back to Sukkot– part of the holiday observance is to create a flimsy “structure” with a semi-see though roof–the roof must be built from something that grows in the ground. The structure is called a Sukkah. My friend Eddie built his Sukkah from scratch using raw materials, kind of like the one below. He is what’s known in Hebrew as שוויצר which translates as “freaking show-off.” As for me, I put together a pre-fabricated Sukkah like the one at the top of this post. During Sukkot we eat, entertain, and some even sleep in this structure. Personally my favorite part of the holiday is inviting over friends and hanging out in the Sukkah, It seems less pressured than when they come into the house and hang out. It reminds us of the life of the ancient Israelites life, wandering in the wilderness for 40 years living in structures like this (and arguing over whether or not Moses should stop at a gas station to ask for directions). More importantly, existing in this kind of flimsy structure, reminds us of the frailty and transience of life and in the end, our necessary dependence on God. Sukkot has a lot of great meanings, perhaps the best one for today’s world is the fact that it is the Holiday when we pray for the rest of the world. And whatever your religion or political affiliation, I am sure that you will agree that the world needs it! In Temple times, the High Priest used to make 70 sacrifices during Sukkot, representing a prayer for each of the nations of the world. (I would imagine that the five days before Sukkot was a period of prayer for 70 cows). Sukkot is a happy holiday it referred to in Hebrew as Yom Simchateinu (the day of our rejoicing) or Z’man Simchateinu (the time of our rejoicing). The reason for our rejoicing has nothing to do with the fact that we are eating (after Yom Kippur) or that we put down our hand tools. From building the Sukkah, “living in it’ for a week, to tearing it down, Sukkot is a fun and Joyous time for family and friends. We also invite ancient Jewish figures, one different every night. These figures are called Ushpizin (righteous guests) and include Abraham, Isaac, Jacob, Joseph, Moses, Aaron, and David. Now if you are cooking for your own Sukkah, I wouldn’t worry, these guys don’t eat that much. Oh and the reason the five days after Yom Kippur are the the most dangerous days in the Jewish calendar? It’s an interesting story. Generally Jews do not start preparing for any holiday before the previous one has ended. It’s not a superstition thing, it’s that we need focus all of our attention on the holiday at hand before we can move on. This is doubly important when the holiday before is Yom Kippur when we are praying hard asking for forgiveness. On the five days after Yom Kippur Jews all across the world start building their Sukkahs. The problem is that most Jews aren’t great with tools. And for many of us (like me) the last time we picked up a tool or stepped on a ladder was the day we took down the Sukkah last year. If you can you should peek out your window and observe your Jewish neighbor building their Sukkah–it is the construction equivalent of the Keystone Kops. Well except for my friend Eddie the Sukkah show-off. The once-a-year use of tools, ladders, etc., is why the five day period is the most dangerous days on the Jewish calendar (it may also be the day where you hear a frustrated Jewish neighbor cursing in some ancient tongue that even they didn’t know they could speak). It is the time where most young Jewish children learn their curse words. Sukkot starts Wednesday night at sundown maybe ya’ll can join me over the next few days, pray for the safety of each nation, may they all remain safe and prosperous, may the ones who fight terror remain vigilant, the ones that promote terror reform their ways, and the ones that are on the fence get a backbone.